Warren Spector's mysterious Disney-themed videogame will finally come to light next within the next couple of weeks. 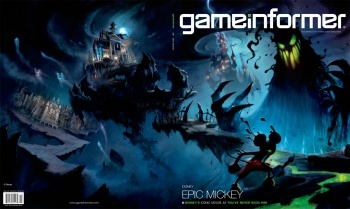 Game Informer's Andy McNamara has made it known that Disney Epic Mickey (the title he gives the videogame on his blog) will be featured in the magazine's November issue. Before you get pains from having to wait a month, take a second and remember that magazines tend to hit stands a month earlier than they are actually labeled, meaning we should see this issue very soon. Up until now, all we've heard on Epic Mickey are rumors and all we've seen are some concept art shots. As rumored, painting is definitely involved in Epic Mickey as we can see what looks like a paint-covered Mickey Mouse holding a paintbrush on the already revealed cover of the issue. He's going up against an unfamiliar enemy, though my instinct tells me it could be a version of the Phantom Blot, a longtime Mickey Mouse foe. The cover also shows three areas that Mickey will have to no doubt tackle and save. To me, these look like the "It's a Small World" attraction, a dark version of the iconic Cinderella's castle, and the Haunted Mansion. After seeing this concept art and now the GI cover, Epic Mickey looks like an absolute dream. Based on how the game combines a hint of Fantasia and a dash of Steampunk to Warren Spector's proven track record (it's being developed by Warren's Junction Point Studios), I can't wait to see what this game has in store. According to Game Informer's Epic Mickey landing page, where new details will be released throughout October, the title is confirmed for the Nintendo Wii, will be single-player only, and is slated for Fall 2010.